No, you won’t have to pack the sleigh for a trip to the North Pole (or Canada), just head beyond the city borders to one of a number of actual farms that grow and sell Christmas trees. Many have more to do than simply picking chopping down of a tree. Little Hills Christmas Tree Farms in Petaluma offers free popcorn and cider, ornaments for sale, and a visit and picture with Santa. While Santa’s Tree Farm near Half Moon Bay offers a Christmas village with train rides, miniature golf with Frosty, and reindeer mascots. There are neighborhoods that live for this season to festoon their homes and yards with as much blinking doo-daddery as their utility budgets can manage. Christmas Tree Lane (Thompson Ave) in Alameda and Parkway Estates (Chestnut St) in South San Francisco are two of the best. You can tour these places for free, as well as hit all the public squares that have erected enormous lit trees and decorations, like Jack London Square and Pier 39, and your nearest mall. Besides an opportunity to support the arts, the Nutcracker is one of those classic Christmas traditions like roasting chestnuts or trimming the tree with actual lighted candles. Pretty much every professional ballet troupe will be performing the Nutcracker throughout December, including the San Francisco Ballet, Silicon Valley Ballet, San Jose Youth Ballet, Oakland Ballet Company, Berkeley Ballet Theater, etc. The park at the center of San Francisco’s retail district is ground zero for holiday-ness every year, with an 83-foot tall tree decorated with 33,000 lights and 1,100 shiny ornaments, an ice rink and a café that sells hot beverages. You’re also surrounded by Macy’s and other big department stores that spare little expense in decorations. You can be sure Santa will be making regular appearances as well. Trying not to be outdone by its neighbor to the north, San Jose has its own downtown holiday spectacle. This one is all about community involvement, with everyone from the local Shriners to the Girl Scouts sponsoring one of the many decorated tree or displays. There are live performances (again by local groups), Santa, vendors, and an ice skating rink across the street. The rather expansive Vasona Park in Los Gatos is the scene of a drive-thru holiday display every December, sponsored by Santa Clara County Parks and created by Los Gatoans. The 1.5-mile route meanders past an erupting volcano, Santa shooting hoops, and tunnels of lights, with special music and sound effects piped through your car’s radio. If you want to buy a gift both unique and local for the holidays, this is your best bet to find something of interest. The fair boasts 200 juried exhibitors offering ceramics, housewares, textiles and furniture. There’s even items from indigenous communities across the globe. Saturday, 12/20, 10am-6pm, Craneway Pavilion, Richmond. To a journey to Victorian London, complete with teashops, pubs, and street performers, all within the cozy confines of the Cow Palace. Some visitors get in on the act as much as the performers, accents included, and you can actually buy things like hand-tailored great coats a la Sherlock Holmes. Saturday and Sunday, 12/20-21, Cow Palace, SF. It’s not quite New York, which often has the benefit of snow, but there’s a lot to see and do to get you in the Christmas spirit. 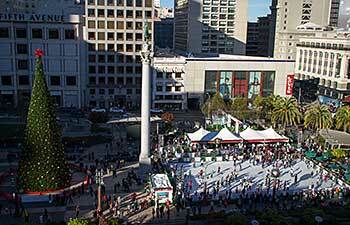 Start with Union Square’s towering Christmas tree and ice skating rink, visit Santa at Macy’s, window shop you’re way around the square, see the snow fall at the Hyatt Regency atrium, and visit the elaborate gingerbread house at the Fairmont atop Nob Hill. It’s that time of year when the gods save us from eternal darkness and decide to bring back the sun, also known as winter solstice. Celebrate with your fellow druids on Ocean Beach for dancing, singing, drumming and non-alcoholic beverages, 4pm. Or join a family-friendly walk in the Presidio, starting at Rob Hill and ending with a campfire at the Rob Hill campground, 5-6:30pm. Saturday, 12/20, SF. It’s the final day of the Berkeley Art Museum and Pacific Film Archive at its current, long-time location, before they reopen in their brand spanking new location in early 2016. Celebrate with music, sound and performance art, and art-making for kids, and join a procession to the new home currently under construction. Sunday, 12/21, 11am-5pm, 2575 Bancroft Way, Berkeley. Enter your email address to follow SFbaytripper and receive notifications of new posts by email.